The Los Angeles school board has unanimously approved a set of policies that board members said would provide families with a higher level of protection from federal immigration raids. Among the safeguards in the sweeping set of guidelines approved Tuesday: No immigration officers will be allowed on campus without clearance from the superintendent of schools, who will consult with district lawyers. Until that happens, they won’t be let in, even if they arrive with a legally valid subpoena. The resolution reaffirms the District’s commitment to making every school site a “safe zone” for students and their families, according to an LAUSD statement. “Our students and parents are currently living in fear every day,” said Board Member Dr. Ref Rodriguez, who co-sponsored the resolution. Rodriguez’ district includes Highland Park, where in February ICE agents took Ramulo Avelica-Gonzalez into custody while he was on his way to drop one of his four children off at Academia Avance:; his 13-year-old daughter Fatima was in the car at the time and video recorded incident. She can be heard on the video sobbing. “This resolution is our commitment that fear stops at our school doors. When our students and families come to our schools, they are in safe havens,” Rodriguez said. “These are commitments we have already made,” she emphasized. 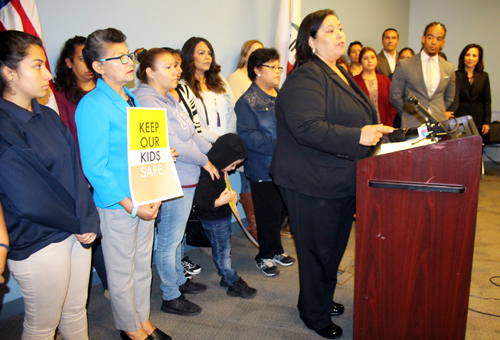 Rodriguez and Garcia, joined by supporters of the policies, held a press conference in front of District headquarters before the school board meeting Tuesday. California Schools for Sanctuaries, a broad-based coalition comprised of community-based organizations, leaders from traditional public and charter schools, civil rights and immigration advocates urged passage of the resolution, Supporters said the resolution formalizes LAUSD’s earlier actions and provides “clear steps” that District teachers and staff can take to protect students. The resolution directs L.A. Unified Superintendent Michelle King to develop a plan within 90 days that will train teachers, administrators and other staff on how to quickly respond to ICE agents. Last year, the school board approved a resolution that resulted in the issuance of a guide, which was disseminated to all employees throughout the district, and the creation of Extended Support Sites in every local district, a hotline (1-866-742-2273), and District webpage with immigration resources provided by community partners and legal organizations. Backers said the latest resolution was the most comprehensive to date, developed by the American Civil Liberties Union over several months. “This is an important opportunity for LAUSD to be a model for the state and for the nation,” said Sylvia Torres-Guillén, director of education equity for the ACLU of California. The resolution also does not let the Obama administration off the hook. Millions of people are living in the United States without legal authorization. Many are parents or relatives of children, who have a long-established right to attend public schools regardless of their immigration status. Torres-Guillén said it’s important that school staff know exactly what to say and do if immigration officers arrive. They are to tell them simply to keep out. Then it will be up to senior officials to assess the validity of credentials and any legal authority to enter district property or obtain information, she said.